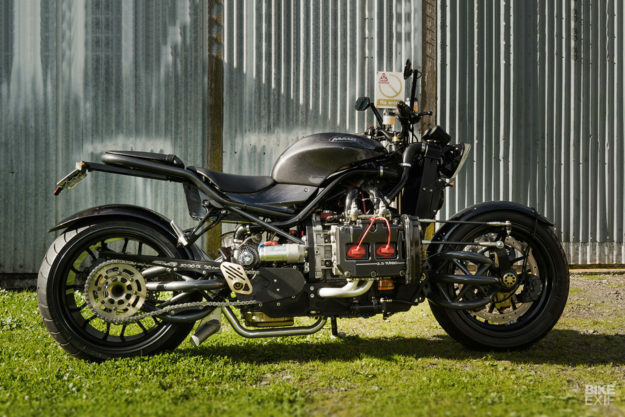 In the custom world, there are few more challenging builds than designing a motorcycle around a car engine. They’re heavy and torque focused, and trying to physically fit one into a production bike frame is easier said than done. But what if your starting point is a car engine and you build everything around it? 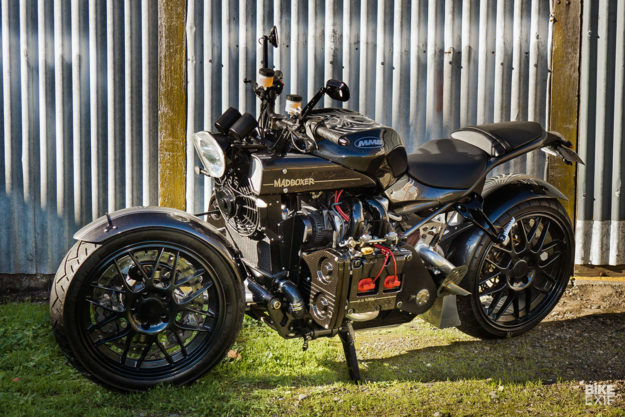 That’s what New Zealander Marcel van Hooijdonk did to create this incredible ‘Madboxer’ custom. The Madboxer, as good a name as any for this machine, has been ‘in the build’ for over five years. A toolmaker by trade, Marcel is more than a dab hand behind a set of tools, so when a friend sent him an email with a photo issuing a challenge, he leapt at the chance to put his skills towards something a little different. 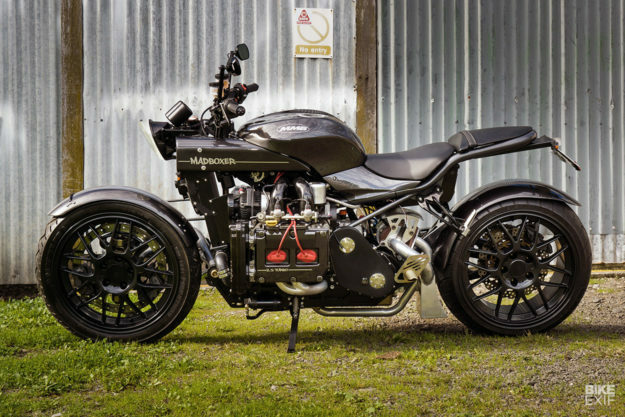 “It all started off as a bit of a challenge from a mate in Aussie, Harry, who came across an artist’s impression of a Subaru-powered motorcycle concept—with the comment “something for you to knock up in the shed, mate,” says Marcel. The car engine was obviously the key to this build, and Marcel had a few options to choose from. The most readily available Subaru engine in NZ is the long-lived EJ series, with capacities ranging from 1.5 to 2.5 liters, and found in most Subarus since 1989. Marcel passed over the ever-popular 2-liter mill, and instead went with a turbocharged EJ25 out of a second generation WRX. To start the project off, Marcel checked to see if it was even possible to make the Madboxer a reality. Now committed, Marcel had to lay the groundwork for his build with some serious screen time. Like most serious builders, he started with a computer, put together a CAD drawing, and got signoff from the regulatory body that covers all modified vehicles in New Zealand—the Low Volume Vehicle Technical Association (LVVTA). 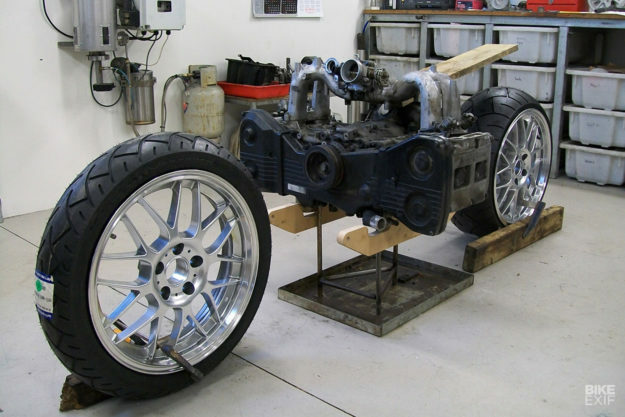 “Once I had the motor block and wheels in place I started in AutoCAD, making drawings of the center steer hub, swing arms and the main chassis sides, he says. The drawings were also used for programming the CNC milling center and lathe, which carved out the individual pieces of the bike ready for assembly. It wasn’t a straightforward job however, and took a few tries to get everything just right. Marcel also had to work out a steering system that met with the approval of the certification panel. 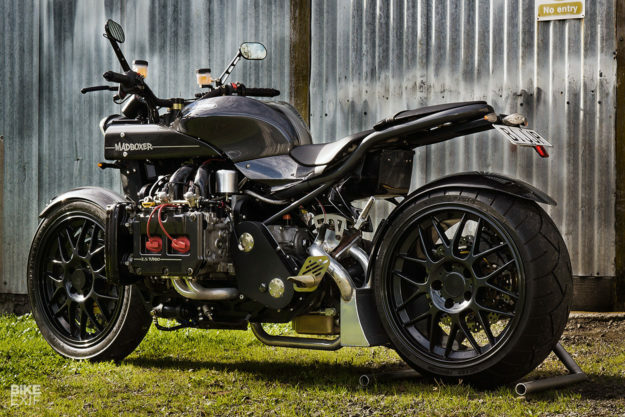 The bike slowly took shape, with a Kawasaki fuel tank, wheels sourced off the NZ eBay equivalent TradeMe, and a smaller twin-turbo unit from a Subaru Legacy replacing the big WRX turbo. The result is an engine that runs very smoothly, even though it has no real flywheel as such. 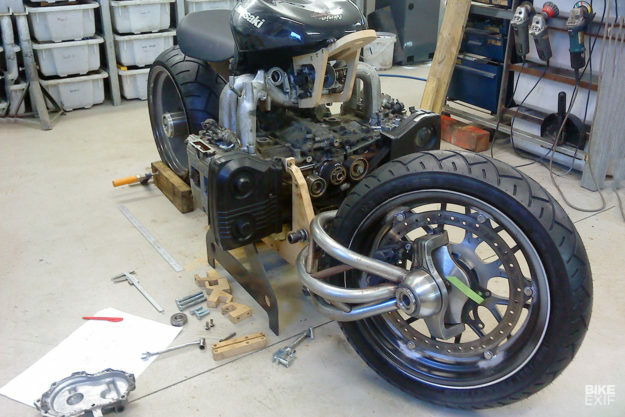 Marcel opted for a modified Japanese 2-speed automatic transmission, using a chain drive to get power to the rear wheel. 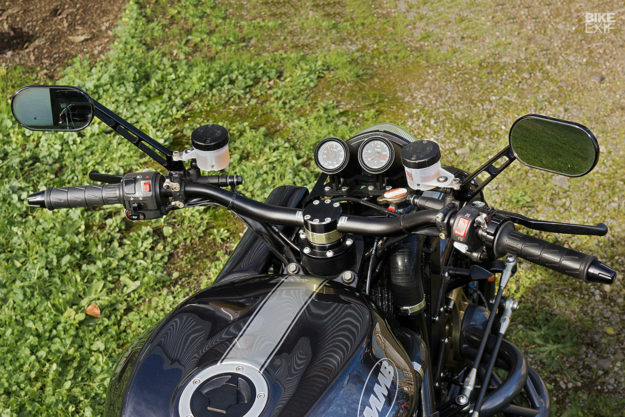 Like other “automatic” motorcycles, there’s no gear lever on the foot pegs—just a button on the handlebars to change gears. 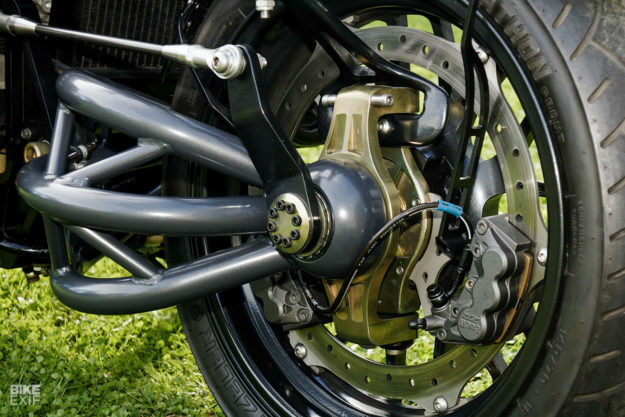 Braking is just like a scooter, with a bar-mounted lever for the Buell-sourced brakes. After all the engineering work, it would be a shame if Madboxer became a trailer queen. But thankfully Marcel fought it out with the LVVTA certifiers and won the day. The Madboxer is a thing of strange beauty. 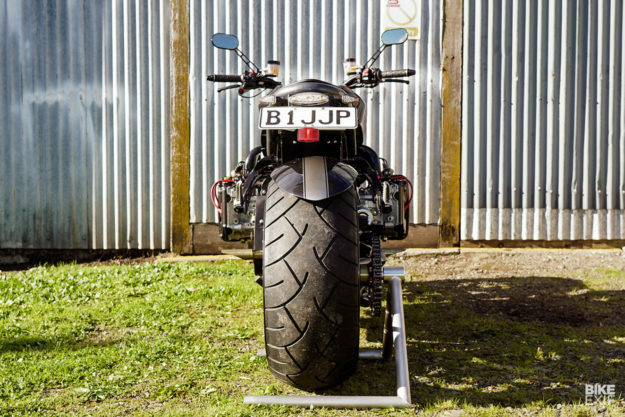 Tipping the scales at 313.5kg, it’s heavy by motorbike standards—but with a boxer engine, the bike holds the majority of its weight down low in the chassis. 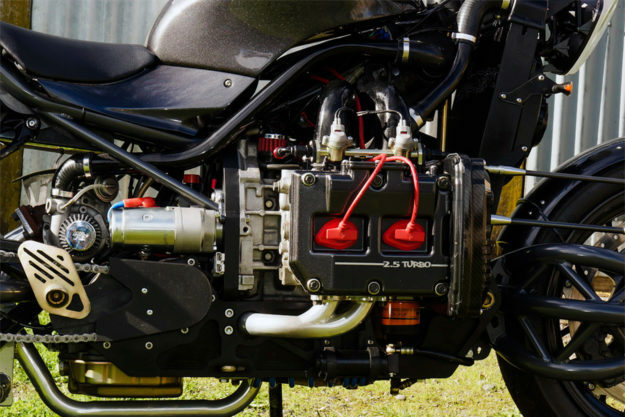 With torque levels most bikes can only dream of, Madboxer is sure to fly down the road when ridden. And that’s just what Marcel plans for its future.